In last week’s WIN eNews, Rob Sherrill listed the 5 of the Top 10 moments — numbers 6 to 10 — in high school wrestling in 2012-13. In this week’s release, the following are the top five moments in that list. Mike Grey (2006) and Andrew Campolattano (2011) preceded Anthony Ashnault as four-time state champions. But the 138-pounder from South Plainfield High did them one better in the final match of the high school season. Ashnault scored a double-leg takedown on the edge with nine seconds remaining, breaking a tie and gaining a 4-2 victory over Gary Dinmore of Fleming Hunterdon Central in the final. Voted the tournament’s Outstanding Wrestler, Ashnault finished his career 170-0, including a 40-0 record this season to become the first unbeaten four-time champion in New Jersey history. Dinmore, who rode Ashnault out in the second period and tied the match with a third-period escape, had not lost since Ashnault beat him 5-2 in last season’s final at 126. Scott Winston of Jackson Memorial finished unbeaten in 101 career matches from 2005-08, but won only three championships because of a season-ending injury late in his freshman season. Apple Valley was the seven-time defending dual state champion in Minnesota’s big-class 3A, and Inver Grove Heights Simley had a five-year winning streak going in 2A. But two schools which had been working their way up the ladder of national prominence for several years finally broke through to claim dual state titles. St. Michael-Albertville stole the early-season headlines, winning the Minnesota State Christmas Tournament and The Clash National Duals, and closed the book on a dream season by tying the Eagles, 28-28 in the dual state final. 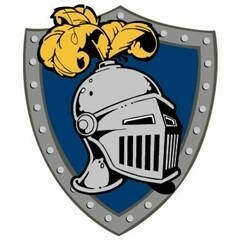 Had criteria been used to determine the champion, the Knights would have won with a 2-1 edge in six-point wins. But, according to Minnesota State High School League rules, STMA and Apple Valley share the title. The Knights won their first title since 2007, when they were still a 2A school. The co-championship stretched Apple Valley’s streak to eight. In 2A, Kasson-Mantorville, which finished a strong third at the Minnesota Christmas Tournament and finished No. 19 in its first appearance in the WIN Top 25 team rankings, nipped Simley, 30-27 for its first state title. Had the individual state tournament been scored, both results would have been reversed. With eight finalists and seven champions, Apple Valley would have outscored STMA, 184-164.5 in 3A. Although each team had three champions, Simley would have earned a 144.5-143.5 edge in 2A, thanks to 11 wrestlers winning matches. From a team standpoint, the 2012 season couldn’t have come to a more disappointing end for Runnells (Iowa) Southeast Polk. Thanks largely to the Iowa High School Athletic Association’s shuffling of the dual state series to the day preceding the individual state series — copying the adjustment made by Minnesota the previous year — several teams elected to weigh in a roster of reserves for the dual state meet. They included Southeast Polk, which did so despite being undefeated and the No. 1 seed. 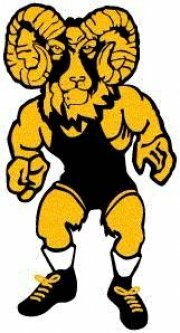 Not only did the Rams finish eighth, but they failed to win the individual state meet and finished second behind Bettendorf despite University of Iowa freshman Cory Clark’s fourth state title. This year, Southeast Polk put its all into both meets … and it paid off handsomely. The Rams breezed past three dual opponents, pounding Bettendorf, 46-20 in the final. They made it a double in the individual state meet, outscoring Bettendorf 180.5-134.5 despite the Bulldogs owning a 4-3 edge in titlists. For Southeast Polk, which finished No. 12 in the WIN Top 25 team rankings, the titles were the school’s first in any boys team sport. With hindsight being 20/20, the Rams don’t regret a thing … but left many wondering what might have been in 2012. The Blue Demons’ Big Three — J.R. Wert (132), Joey Dance (138) and Matt Epperly (182) — won their fourth Group AA state titles in February. With the trifecta, Christiansburg became the third school in as many years to crown three four-time state champions in one season. 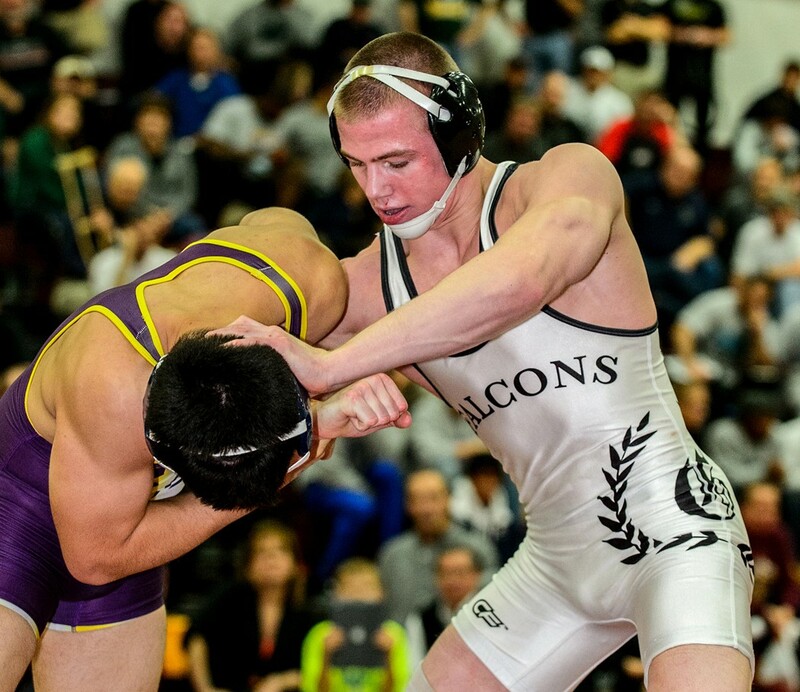 Wert and Dance were up two weight classes from their performances at the Walsh Ironman and the Beast of the East, and Epperly also went up a weight. Wert was a Georgia 2A champion at Madison Morgan County as a freshman. Monroeville (Ohio) was the first school to accomplish the feat, in 2011. Brandon (Fla.) followed suit last year. Should a fourth Blue Demon wrestler, junior Coy Ozias (120), win his fourth title next year, Christiansburg would match another record set by the two schools: four four-time champions in a two-year span. Two-time NCAA champion Logan Stieber won his fourth title for Monroeville in 2010, and senior Kevin Norstrem (138) won his fifth title for Brandon this year. It was a season with relatively few weather-related interruptions. Then February came along. The worst upheaval occurred in New England, where state tournaments in Maine and Massachusetts were postponed due to the snowstorm that slammed the region on the second weekend of February. Originally scheduled as an all-class event that weekend at the Augusta Civic Center, Maine’s three-class tournament was contested at separate high school sites a week later. Massachusetts faced a more difficult challenge. The storm wiped out the first stage of the Bay State’s three-week state tournament series, divisional tournaments. The Massachusetts Interscholastic Athletic Association (MIAA) originally elected to postpone the series one week. The problem: the postponement would have put the All-State Championships and the New England Championships on the same weekend. Faced with the possibility of the New Englands being contested without its biggest state — the All-State meet serves as the state’s New England qualifier — the MIAA switched course and allowed the three-week series to be condensed to two weeks. Massachusetts matched Connecticut with four New England champions. Other states suffered snow-related schedule delays, too. The time schedule for the Kansas state tournaments, held the fourth weekend of February, had to be condensed due to the effects of another crippling winter storm less than 48 hours prior to weigh-ins. And in Virginia, a series of winter storms deprived many schools of multiple matches. Reports of schools having up to 13 dates snowed out this season were not uncommon. The second No. 1 vs. No. 2 match took place just three weeks after the Jordan-Martinez showdown. 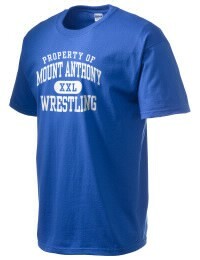 In the final match of the Powerade Christmas Tournament, Dec. 30, at Canonsburg Canon-McMillan. Two wrestlers who ended the season as three-time state champions — junior Chance Marsteller of Fawn Grove Kennard Dale and senior Cody Wiercioch of the host Big Macs — squared off at 170 pounds. 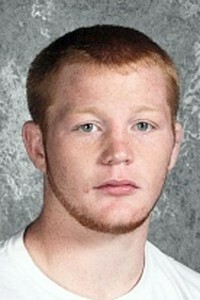 The top-ranked Marsteller escaped three seconds into the ultimate tiebreaker for a 3-2 victory. Marsteller escaped to start the second period for a 1-0 lead, giving him the choice in the ultimate tiebreaker. Wiercioch escaped to start the third period and the two traded escapes in the two overtime tiebreaker periods. In just over eight minutes of action, the two wrestlers were on their feet for all but 12 seconds. Marsteller eventually dropped to 160 to win his third AAA title, with Wiercioch winning at 170. In a meet which ended with a 7-7 match split, four-time state champion Bo Jordan (160) scored the only pin of the match, helping host St. Paris Graham past Lakewood St. Edward on criteria Jan. 29 after the two teams tied, 29-29. The Falcons had a 2-1 edge in six-point wins. Graham won the first three matches, with junior Micah Jordan (132) repeating his Walsh Ironman victory over four-time state champion Dean Heil, rallying with a takedown late in the third period for a 4-3 victory and a 10-0 lead. St. Edward rallied with back-to-back technical falls from Colin Heffernan (138) and Edgar Bright (145), tying the match at 10-10, then took a 13-10 lead on Markus Scheidel’s 9-7 victory over freshman standout Alex Marinelli at 152. Jordan’s 31-second pin gave Graham a 16-13 lead, but St. Edward won four of the next five matches to reclaim a 29-22 lead. But the tide turned at 106. Ahead of Ironman champion Eli Stickley, 4-1 after two periods, L.J. Bentley was penalized three times for four points for stalling on the bottom in the third period, giving Stickley a 5-4 victory and narrowing St. Edward’s lead to 29-25. Eli Seipel’s 14-4 major decision at 113 tied the score at 29 and capped the comeback. It was the second St. Edward dual against a Top 10 national opponent to be decided on criteria during the month. On Jan. 12, the Eagles came out on the winning end against Lombard (Ill.) Montini on an unsportsmanlike conduct penalty. Bennington (Vt.) Mount Anthony completed a quarter century of dominance in Vermont, winning its 25th straight state title. The Patriots also won their first New England Championships team title since 2004. They snapped the five-year New England winning streak owned by their New Hampshire neighbors, Plaistow Timberlane. But the Owls kept the nation’s second-highest sanctioned streak going, winning the Division 1 state meet in the Granite State for the 14th straight year. Three schools won their 13th straight: Brandon (Fla.), Jefferson (Ga.) and St. Paris (Ohio) Graham. Christiansburg (Va.) won for the 12th straight year and Gillette (Wyo.) Campbell County now owns 11 straight state crowns. The Walsh Ironman went according to form this season in December, but there were still plenty of entertaining matches. The first of two matches this season matching the incumbent No. 1 vs. No. 2 in the WIN individual rankings took place in the 160-pound final. That was where Bo Jordan of St. Paris Graham, in what would turn out to be his closest match of an undefeated season, scored a 4-2 victory over Israel Martinez of Lemoore (Calif.). The two wrestled up to their rankings prior to the final as well, dominating their competition en route to the finals. Jordan reached the finals with two pins, a technical fall and a 15-5 major decision, while Martinez followed a technical fall and a 21-7 major decision with two pins. The two closed their careers with a combined seven state championships, Jordan owning four. They also whetted the appetites of college wrestling fans for what could be quite a future rivalry in the Big Ten, as Jordan heads for Ohio State University, Martinez to the University of Illinois. And Jordan put an exclamation mark to his career when WIN and the AAU named him the winner of this year’s Junior Hodge Trophy. 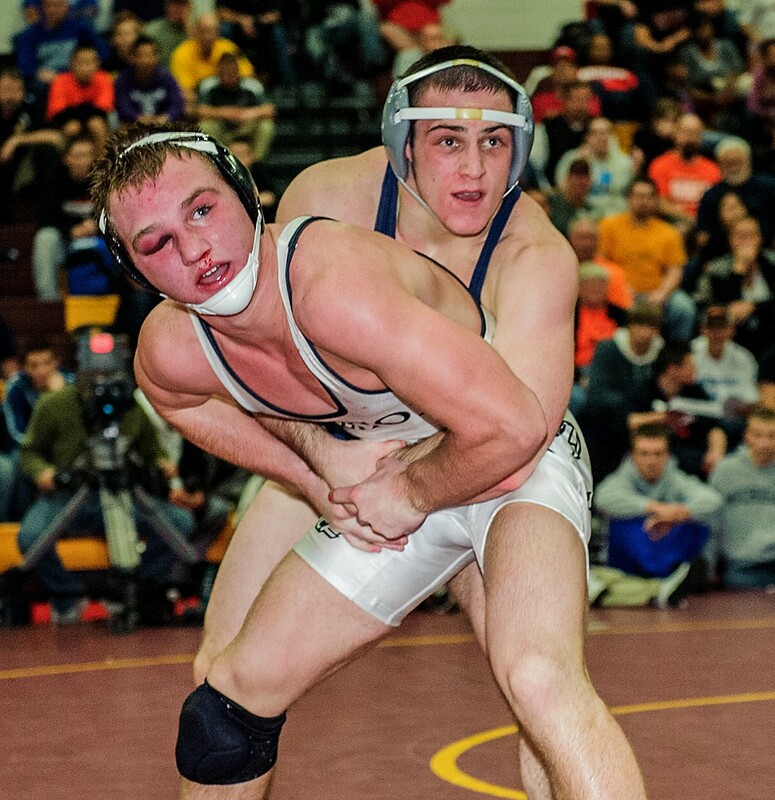 Russell Parsons (right) of Blair Academy won the 152-pound championship at the 2012 Ironman to help the New Jersey prep school win this this national championship. The legendary Jeff Buxton relinquished his post as head coach at Blairstown Township (N.J.) Blair Academy last summer, but he left plenty in the cupboard for his long-time assistant coach and successor, Charles Danhof. With the emergence of senior Russell Parsons (152), the upper-weight leadership of seniors Frank Mattiace (195) and Brooks Black (285) and the return of junior Joey McKenna (132) from a FILA Cadet World Championships injury, the Bucs didn’t show the level of individual dominance of past years but they won their 33rd straight National Prep Championships title — a record for any wrestling team in any arena of competition — by 88 points over Kingston (Pa.) Wyoming Seminary, and placed more wrestlers on the ASICS All-America Team than any other school. The Bucs also completed another wire-to-wire run atop WIN’s Top 25 team rankings.